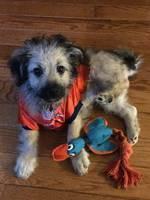 Coventry Animal Hospital asks What is Appropriate for a Dog to Chew? Chewing behavior is normal in dogs and this is especially true of puppies. However, the idea that all dogs should chew bones is controversial. Teeth can fracture if they are hitting hard surfaces such as bones, rocks or solid plastics. Injuries to the mouth can occur from chewing on bones. Gastrointestinal obstruction can occur if a bone or antler is swallowed, but is too is large to pass through the gut. Symptoms include choking, vomiting, diarrhea or constipation, pain and lack of appetite. To find and remove the obstruction, x-rays, intravenous fluids, pain medication, a scope or surgery may be required. Bones that splinter (such as chicken bones) should be inaccessible to dogs and cats, since shards can puncture the gut and lead to life-threatening infections. 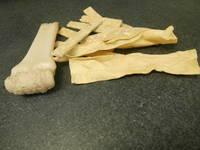 A raw bone may be contaminated with dangerous bacteria such as Salmonella, E. coli or Campylobacter. Exposure to these bacteria may make your dog sick. Although uncommon, there is a risk that owners can become sick when handling their dog’s raw bones. 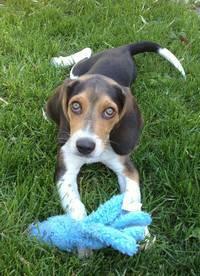 Dogs need chew toys of good quality that are safe for their individual chewing habits. If your puppy/dog is being destructive by chewing items like the coffee table leg, make sure to re-direct it toward appropriate toys with a variety of textures. Never allow it to chew an old shoe, it will not be able to differentiate it from your new pair! You can apply a bitter apple spray on the items that you don’t want it to chew. A crate or baby-gate can be used to confine a dog when it cannot be supervised around those items as well. Soft rubber toys, dental chews or rawhides that have enzymes to help them be digested in the stomach may be good choices for your dog. 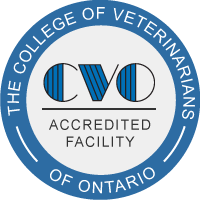 Coventry Animal Hospital acknowledges that dogs like to chew and hopes to keep our canine friends healthy and happy.